SCHÜTZ ECOBULK Intermediate Bulk Containers (IBCs) are market leaders throughout the world as an efficient form of packaging for liquid products. 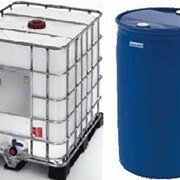 The units are ideal for oil, lubricants, chemicals, food, beverages, pharmaceuticals and many dangerous goods. Each SCHÜTZ IBC consists of a HDPE blow moulded inner bottle surrounded by a steel cage which is mounted on either a steel, plastic or wooden pallet. ECOBULK containers offer unbeatable economical and ecological advantages over other forms of packaging. Easy to stack for transportation and storage (static load up to four high when filled). Multi-trip usage due to modular system, easy replacement of components. Maximum economy through large packaging units from 640 to 1250 litres. UN approved for the transportation of dangerous goods. Fast to fill, easy to discharge at user site. FDA approved for food-related applications. Space-saving dimensions for optimum container shipping efficiency, ie 18 in a 20 container (FCL), 42 in 40 container (FCL) and 52 units into a 48' container. Tailor-made composition of components to fit logistical requirements. Free collection system for empty ECOBULKS. Components reused and raw materials recycled – environmental benefits . Global network for reconditioning and recycling of used ECOBULKS . A single 1000 litre ECOBULK holds the volume of five steel drums in the space of four - a 20% space saving.